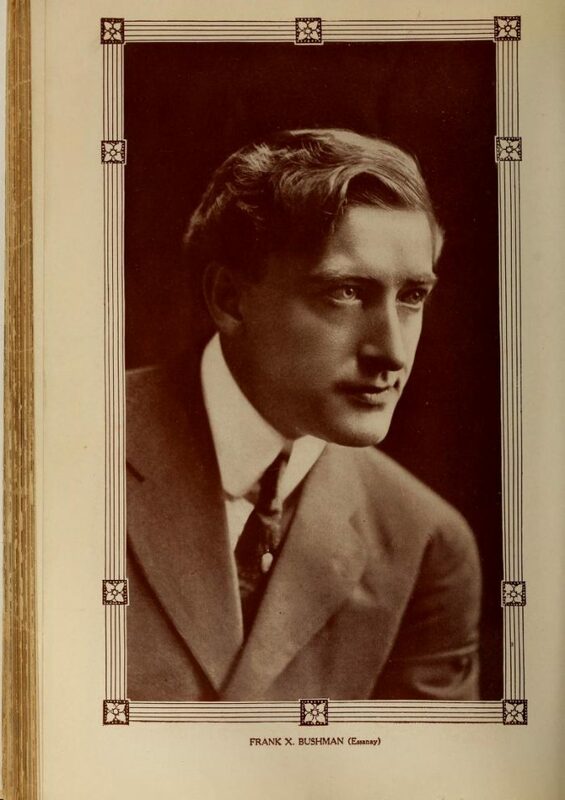 Francis X. Bushman was chatted in the February 1912 edition of Motion Picture Story Magazine. Bushman is portrayed here as a very down to earth individual. He definitely had that reputation, which reflects in other articles of the time that speak fondly of his humbleness. I find it interesting that they refer back to the outrageous Howard Missimer chat that was previously blogged about here: https://blog.silentphotoplay.com/2019/01/07/howard-missimer/ Whether this was an addition by the writer of our chat, or truly said by Francis X., one will never know, but I try to take all of these cute little chats with a grain of salt, anyway. This is because some are more detailed than others, and I get the feeling that the less superficial ones are more reliable. But, of course, I digress. It’s always hard to believe that some of these male actors are so young. Their photos make them seem so much older than they are. He is only 29 here! Unfortunately, I could not find anything that references a house fire where Francis X. Bushman saved people. I wish they’d be more specific when referencing things like that! Enjoy this chat with 29 year old Francis Xavier Bushman from February 1912. It had been reported to me that Mr. Bushman, the Essanay lead, did not take much interest in interviews, the same having become an old story to him; also that he was an athlete, amateur wrestler and physical culturist. “Suppose he insists on going thru a course of stunts with me?” I mused, feeling my flabby biceps, on his front doorsteps. “I knew it!” was my painful thought. An interview terminating in a boisterous manhandling and a broken collar-bone was the best I could hope for. Assuming a very sickly attitude and with a warning hollow cough, I entered the third floor door. The famous Essanay leading man was seated on a stout stool, dressed in duck trousers and a sleeveless jersey, from which the bunched muscles peeped forth in every direction. Instead of glowering at me and making passes like a wrestler, he was smoking mildly on a cutty pipe. “So I have the reputation of being ferocious,” he continued; “funny how old ‘rep’ gets around. In fact, I’m the mildest of men. Besides, a man has a right to keep his body clean and sweet. You see, I’ve gotten beyond the period when a stage hug is charged up to physical exercise. “Let bygones be bygones,” I answered promptly. “My people have been Virginians,” he said, resuming his easy attitude, “for some three hundred years, having come from England originally. I was born in Norfolk, Va., and educated at Amendale College, Md. My friends have always called me ‘Bush,’ and from an early age I showed a fondness for the stage. Yes, my experiences have been quite varied. I started doing boy parts with the Albaugh Stock Company of Baltimore, and then successively — and, let me hope successfully — with the Fawcett, Casino, Temple and Lyceum stock companies. Between times I played on the road in the original ‘At Yale,’ ‘Moulin Rouge,’ and ‘Going Some’ productions, the latter under the Shuberts. “Tell me something about yourself, personally,” I suggested. Mr. Bushman looked at me as if I had dug up something distasteful. “In politics I am a Democrat,” he resumed; “can sing and play a little and attend the opera when I can. I must confess, too, that I miss the regular theater in some things. There is nothing in all the world like the murmur of many voices waiting on the other side of the curtain, the lights, the music, the laughter, the tears, and applause. Why, even the smell from the paint-frame is good. Interesting interview, though it does indeed sound a little embroidered. 🙂 Great photo of Bushman, also.